Publicity Stills of "BATMAN BEGINS"
It’s a question that haunts Bruce Wayne (CHRISTIAN BALE) like the specter of his parents, gunned down before his eyes in the streets of Gotham on a night that changed his life forever. Tormented by guilt and anger, battling the demons that feed his desire for revenge and his need to honor his parents’ altruistic legacy, the disillusioned industrial heir vanishes from Gotham and secretly travels the world, seeking the means to fight injustice and turn fear against those who prey on the fearful. In his quest to educate himself in the ways of the criminal mind, Bruce is mentored by a mysterious man called Ducard (LIAM NEESON) in the mastery of the physical and mental disciplines that will empower him to fight the evil he has vowed to destroy. He soon finds himself the target of recruiting efforts by the League of Shadows, a powerful, subversive vigilante group headed by enigmatic leader Ra’s al Ghul (KEN WATANABE). Bruce returns to Gotham to find the city devoured by rampant crime and corruption. Wayne Enterprises, his family’s former bastion of philanthropic business ideals, now rests in the hands of CEO Richard Earle (RUTGER HAUER), a man more concerned with taking the company public than serving the public good. Meanwhile, Bruce’s close childhood friend Rachel Dawes (KATIE HOLMES), now an Assistant District Attorney, can’t secure a conviction of the city’s most notorious criminals because the justice system has been so deeply polluted by scum like crime boss Carmine Falcone (TOM WILKINSON). It doesn’t help that prominent Gotham psychiatrist Dr. Jonathan Crane (CILLIAN MURPHY) bolsters insanity defenses for Falcone’s thugs in exchange for nefarious favors that serve his own devious agenda. With the help of his trusted butler Alfred (MICHAEL CAINE), detective Jim Gordon (GARY OLDMAN) – one of the few good cops on the Gotham police force – and Lucius Fox (MORGAN FREEMAN), his ally at the Wayne Enterprises’ Applied Sciences division, Bruce Wayne unleashes his awe-inspiring alter-ego: Batman, a masked crusader who uses strength, intellect and an array of high tech weaponry to fight the sinister forces that threaten to destroy the city. After 4 franchises, namely Batman, Batman Returns, Batman Forever and Batman and Robin, finally did they realize they should have focused on Batman himself in the movie instead of the comic villains. Since his first appearance in 1939, 'The Bat-Man', masked vigilante over the streets of Gotham City, has proved to be an enduring favourite of the comic book superheroes, due to his darkness, his mortality and, most importantly of all, the adaptability of his myth to changing times. Tim Burton's Batman certainly nailed the legend's noirish, gothic look, but was less assured in its handling of tone - and a rash of unmentionable sequels brought the predictable diminishing returns. Now, however, Christopher Nolan's 'Batman Begins' wipes the slate clean, taking viewers right back to the caped crusader's origins - the bat has well and truly abandoned its cave and headed into a more epic territory. In a short summary for the uninitiated Batman newbie, Begins follows Bruce Wayne’s journey to becoming Batman, from the murder of his parents in a back alley to training in a remote Chinese province under the care of a mysterious martial arts master with dire back plan of his own. Batman, unlike most superheroes, isn’t driven so much by a desire to do right but by a burning need for vengeance. Apparent through Chris Nolan’s work like Insomnia and Memento, he and genre veteran David Goyer builds towards that admirably, taking time to languish over Bruce Wayne’s internal conflict. Fans of the Dark Knight's on-screen iconography will not be disappointed by this new film, which traces Batman's customised suit ( keeps your ears up for some bat parts made in Singapore.. ), car, utility belt, weapons and secret cave right back to their very beginnings, while giving them a more functional, and dare I say more rationalised, feel. 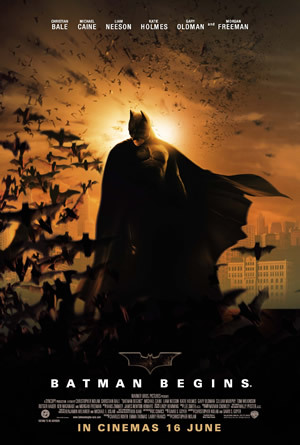 While still at heart a dark fantasy, this adventure is more grittily realistic than Batman's previous outings, with stunts and effects that are mostly physical rather than computer generated. The fights are close and hard, but the only qualm about its action sequences is that Chris Nolan is no Michael Bay. At times, the audience ( me.. ) find it a step too fast to catch up with that it’s most visually striking sequence, is reduced to a black blur. But fortunately in spite of that, the movie works because he gets the Dark Knight in a way no one else yet has. “Batman Begins” is a visual star studded rollercoaster. Without a doubt, the film is at its best when breathing life into the people around Batman. Nicely complementing the film’s harsh atmosphere is a fantastic A-list cast born for their respective roles. As much as Michael Gough seemed the perfect fit during his time on the previous four Batman films, Michael Caine is Alfred Pennyworth. Gary Oldman also is Lt. James Gordon, and Morgan Freeman turns in a wonderful performance as one of the newer additions to the Batman universe. Equally remarkable is Liam Neeson as Bruce’s master, bringing a clever twist to his previous 'knight' roles in The Phantom Menace and Kingdom of Heaven and Cillian Murphy as the creepy-as-hell Scarecrow, but what’s most important about this film is its lead star, Christian Bale. Bale has been, without a doubt, one of the most powerful actors of his generation who manages to make Wayne seem a real, complex individual, while giving Batman a formidable physical presence. Unlike past actors who have donned the cape, Bale is not only the perfect Batman, but also the best Bruce Wayne that has come around. Stealing a tint of his performance as Patrick Bateman from “American Psycho,” Bale offers the insecure reserve of Bruce Wayne’s dark past in his unforgiving eyes. In his best, and darkest, outing to date, Batman Begins is a solid re-entry into the comic book hero’s crime riddled world. Missing are the exhilaration and fun of its predecessors but in its place is a closer examination into the nature of the character. Back to its origin. Back to the beginning. This is how the Batman franchise should have started out in the first place.